There are no trinomials in sight in this interactive Powerpoint introduction to factoring! It is meant to boost confidence and get students comfortable with the thinking process needed to successfully factor quadratics. 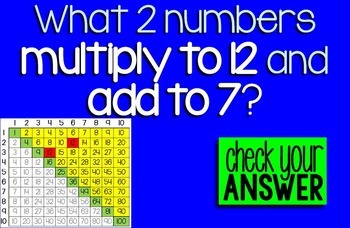 Students are asked questions like "What two numbers multiply to get 6 and add to get 7?" 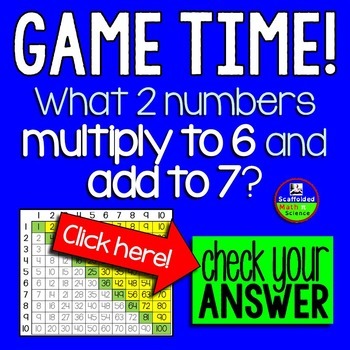 By clicking on the green "Check your Answer" box on each slide the class can check to see if they found the two numbers! By introducing quadratic factoring this way, students build their confidence and get used to the thinking needed to factor. I teach Special Ed, so all of my materials keep Special Ed students in mind. 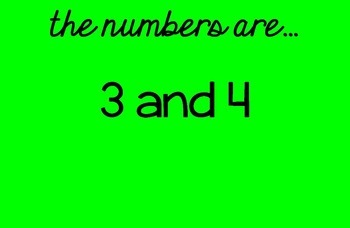 The Powerpoint is meant for students who struggle with Math and need concrete steps. I handed out whiteboards to my class to use during this introduction. Scrap paper would also work. At the end of the presentation are slides that accompany Cereal Factoring Mat. You can either use the game slides only or both. I introduced factoring both ways this year to meet different learning styles.